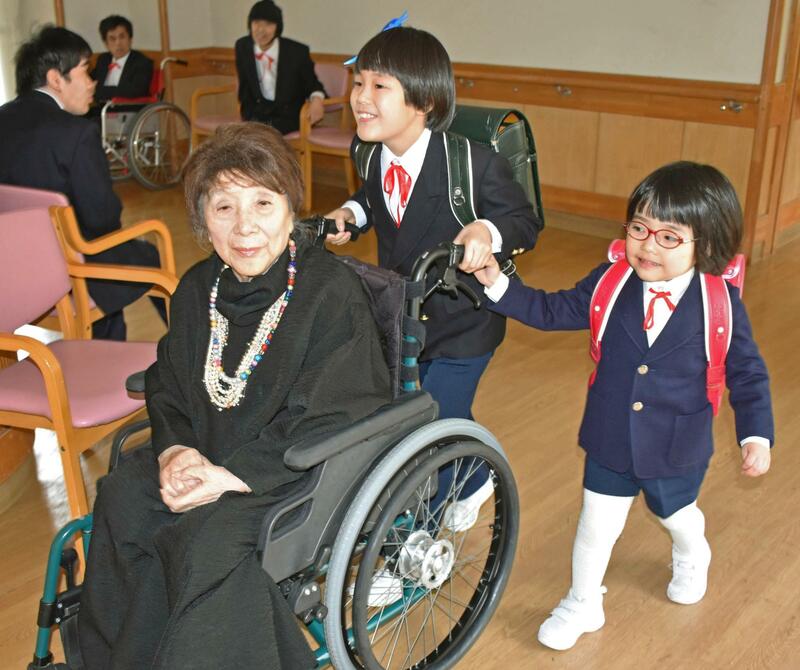 SHIZUOKA - As Japan’s first school for people with disabilities celebrated its 50th anniversary last week, its founder — 91-year-old actress Mariko Miyagi — has been hailed for her “revolutionary” work battling prejudice and working to create an inclusive society. When Miyagi launched Nemunoki Gakuen in 1968, prejudice against people with disabilities was common and strong in Japan. The government even conducted forced sterilization on thousands of disabled people. The actress also faced stinging personal criticism, with some people blasting her campaign as a mere publicity stunt. But Miyagi persisted, and today her school — located in a mountainous area in Shizuoka Prefecture within what is called “the village of Nemunoki” — is home to 73 people with physical or intellectual disabilities between the ages of 4 and 78. Of the village’s residents, 33 attend the special school. While the institution in the city of Kakegawa offers math and Japanese classes, it’s focus is on nurturing artistic and musical sensibilities. “Even though I cannot read characters, I can read musical scores. Strange, isn’t it?” said a girl holding sheet music as she moved to the rhythm of a performance at the school. 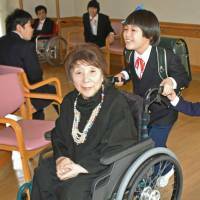 Miyagi decided to create the school after she took on the acting role of a child with cerebral palsy in 1960 and later learned that children with disabilities at the time could not receive formal education in a school. She searched for land and raised the funds, building the first incarnation of the school in a city now known as Omaezaki, in Shizuoka Prefecture. At that time, the Eugenic Protection Law — in force from 1948 to 1996 — authorized the sterilization of people with intellectual disabilities, mental illness or hereditary disorders to prevent births of “inferior” offspring. According to the Health, Labor and Welfare ministry, around 25,000 people were sterilized under the law. Of that figure, some 16,500 are believed to have undergone the surgery without their consent. Legislation protecting the welfare of children or people with disabilities was also inadequate, and Miyagi’s wish to create the school was granted only as a special case by the health ministry and Shizuoka Prefecture. The school was relocated to Kakegawa in 1997. Hiroshi Shimizu, an honorary professor at Saitama University specializing in the education of children with disabilities, called Miyagi’s establishment of the school “revolutionary” and said it significantly influenced the course of Japan’s education of children with disabilities. “At the time, children who could not walk to school due to physical disabilities were automatically exempted by the government from attending schools, leaving them with no choice but to be secluded at home,” Shimizu said. Today in Japan, children with disabilities are educated either within the mainstream school system or, if necessary, at dedicated schools specially equipped to serve their needs. Japan ratified the 2006 U.N. Convention on the Rights of Persons with Disabilities, which says they should not be excluded from the general education system. Shimizu is also supportive of Nemunoki’s approach of using art and music. “Classes that pay a high regard to expressive activities such as art and music are the heart and essence of education, in the sense that they allow one to gain freedom through expressing oneself,” he said. Miyagi said there were times when she felt powerless and thought about abandoning the school, but in the end she could never do it. “That’s because the children love me, and I’ve fallen in love with them too,” she said. Kids at the school refer to Miyagi as “mommy” and often call out to get her attention. She always responds but admits tending to them is at times exhausting. Given her advanced age, Miyagi has to lie down often and often relies on a wheelchair to move around. Yet she has not given up on her dream of creating a place where people with disabilities and those without can gather together. “I don’t have that much time left in life, but I am still not done,” Miyagi said, referring to her plan to construct a park for all within Nemunoki village. “It makes me think I have to keep going,” she said.